I’ve worked as a librarian, archivist and information specialist and as a part-time journalist. Writing is my passion and I have made more time to pursue it. Two graduate degrees helped me grow fond of doing research and digging things out from sources around the globe. On this blog I try to give my readers as much background information as I can so that they can better digest the fast-breaking news that comes our way. My persona is taken from my late Labrador Retriever, Sam Henry who died suddenly and in my arms in April, 2010 the day before Easter. His “stable mate” is a Jack Russell Terrier called Impulse or “Imp.” These two are the “samandimp” in the On My Watch url. Sam Henry was the neighborhood attraction. People liked to stop by to see a Labrador Retriever jump the way the JRT taught him to when he was a pup – straight up with spring action. You cannot imagine the cards and flowers I received when he died – he was just everyone’s idea of a great dog. He was only 5 years old. If you find things of interest here or like the writing then hats off to a liberal arts education. My interests have always been far-reaching and varied and I have been fortunate to have been able to have followed them throughout my years of formal education and beyond. Thank you for visiting our blog. We hope you will come often and comment. The late Sam Henry. Such a beautiful boy. We had such temperature swings last fall in the northeast that this viburnum did not know what day it was! Roses and a hydrangea Fall, 2009. An oak-leaf hydrangea, Fall, 2009. Can’t eat sweets and it’s your birthday? How about your age in candles stuck in a baked potato, old girl. Impulse (“Imp”), my JRT, is like most people: she doesn’t like her picture taken, thank you. Daisy, a demanding and adorable aging Bassett Hound spends some nights with us when her “mother” is away. Forsythia along the drive were magnificent this year. Sam Henry is missed but Imp is more than fine. 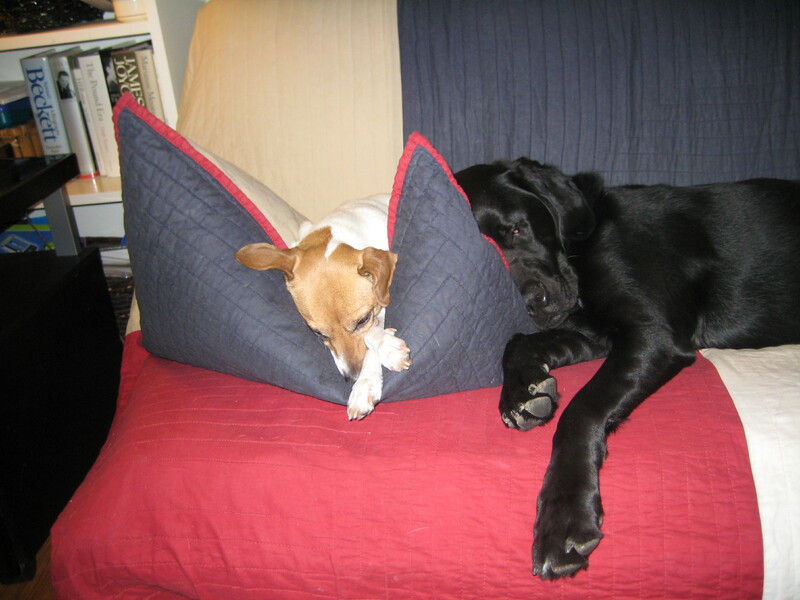 JRTs are like the energizer bunny – places to go; people to meet. Below – a favorite picture from Britain’s Telegraph.